You are going to start to hear a lot of talks about the tropics over the next 4-7 days. 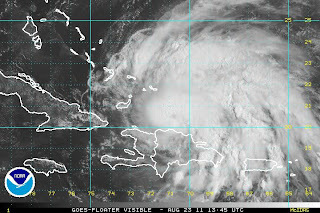 Hurricane Irene has developed and is expected to get stronger over the next 24 hours. Currently, Irene is located 55 miles north of the Dominican Republic and is moving WNW at 10mph. As of the 7am CT update from the National Hurricane Center, Irene is a Category 2 hurricane with maximum sustained winds of 100mph. 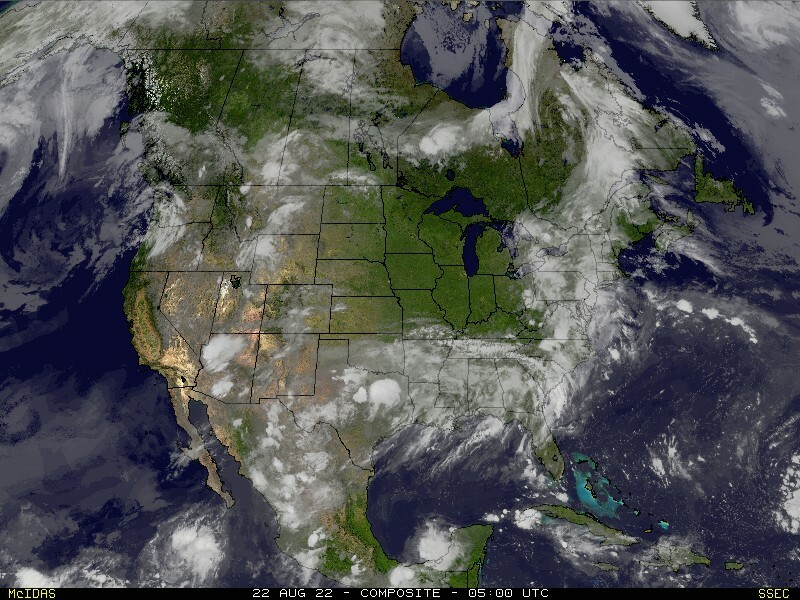 Here is a look at the visible satellite image from space. The picture was taken at 8:45am CT. Forecasters at the National Hurricane Center (NHC) expect Irene to gain strength within in the next 24 hours once it gets away from Hispaniola. In fact, the forecaster writing the morning forecast update said the storm getting away from Hispaniola "should allow for Irene to become a major hurricane within the next 24 hours." Where will the storm go? That is a good question. Here is the latest forecast from the NHC. This is when we start to talk about the "cone of uncertainty". Why do we call it that? That is because we (forecasters) don't know for certain. Forecasters have a pretty good idea of where it is going to go, but this is not a time to be splitting hairs with a forecast. Too many people would be impacted by the storm making a little wobble at the last minute. That is the reason for trying to narrow it down but also keep our options open. Something else that is good to look at is the plot of various forecast models. This is called a "spaghetti plot". Each line represents the forecast path of the storm over the duration of the forecast model's run. You can see how there is a variance from model to model. This is why forecasters look at the various runs to see if there is a trend the models are going with. More of a consensus. I know there is some talk about a direct hit in North Carolina but if you look at this morning's plot of the forecast models it appears that the storm may take a run to the right and move just off the coast of North Carolina. 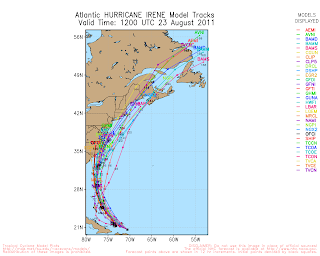 It will be interesting to watch over the coming days to see how Irene tracks.